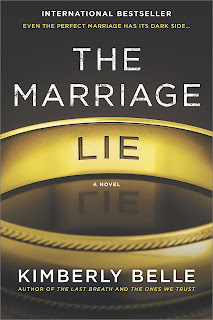 My book club read The Marriage Lie by Kimberly Belle this month, and while I had to miss because of this stupid cold, I have a feeling this book garnered quite the conversation. This is because I think this book falls squarely into the “Books You Love to Hate” category – and those are always so much fun to tear to pieces. When I say “Books You Love to Hate,” I do not mean it is terrible writing or anything like that. I mean books that have plots or characters that drive you crazy. In The Marriage Lie, the wife, Iris, finds out her husband has died in a plane crash. However, he should not have been on that plane headed to Seattle according to what he told his wife. He should be headed to Orlando. The first part of the book becomes a guessing game for Iris and readers. Was he having an affair? Did he have a whole other family and life on the opposite coast? It becomes pretty obvious that while her husband is the liar of all liars, he did not have a whole separate wife and children. Instead, he had a whole life she knew nothing about before he met her involving one crime after another. Astute readers will be able to guess where this book is headed early on – he is not dead. Once the author and Iris are both in agreement with this fact, readers have to deal with multiple soliloquies where Iris waxes on about how even after all the lies, she still loves him. Gag. Y’all, I’m sorry, but I wanted to hit the women in the head with the book. Let me be clear about something. I think it is absolutely terrible when a woman finds out a huge secret about her husband. And, I know it does happen. I have friends it has happened to. The ones that scare me the most are the women who claim they truly had no clue what he was up to. So, as I was reading this book and hearing the times Iris’s friends and family asked her difficult questions about her husband and heard her respond, “Well, no. I gave him a long leash,” I wanted to scream. Because knowing about your life partner is your business. I am all up in my husband’s business. And I expect him to be the same with me. As the book was wrapping up, I was seriously at the point of wanting to hurl my earbuds across the room (listened on audible, y’all – and the dramatized reader was highly entertaining). But, Kimberly Belle found a way to redeem the book with the book’s FINAL PARAGRAPH. Way to go. You got me. And I would have really mad at you if you didn’t. If you want to see what all the hype is about, you can jump into your library’s wait list or you can purchase it from amazon here. This is an affiliate link. Thank you for supporting my blog!